A firefly's blinking behind is more than just a pretty summer sight. It's known that fireflies flash to attract mates (SN Online: 8/12/15) - but the twinkles may serve another purpose as well. Jesse Barber, a biologist at Boise State University, had a hunch that the lights also warn off potential nighttime predators. He wasn't the first person with this hypothesis. As far back as 1882, entomologist G.H. Bowles wrote of fireflies: "May not the light then serve... as a warning of their offensiveness to creatures that would devour them?" But the theory hadn't been tested, until now. "We always assumed that bats don't use vision for much," Barber says. Many species of fireflies are "chemically protected," meaning they taste awful to predators, Barber says. Yet if an insect doesn't offer a warning of its bad taste, it may get sampled anyway. Barber noticed that, unlike moths, which signal their toxicity to bats with noises, fireflies don't make a peep (SN Online: 7/3/13). He wondered if lightning bugs were warning bats of their disgusting taste with their blinking lights. Barber and colleagues wanted to see if it took bats longer to learn to avoid fireflies when the flashings were masked. The team began by introducing fireflies to three bats that had never encountered the bugs before. The bats learned to avoid the bright creatures "after just a few interactions," Barber says. Those early exchanges went something like: catch, taste, drop. Soon, the bats avoided the fireflies completely. Next came the tricky part: The team needed flying fireflies that wouldn’t blink. 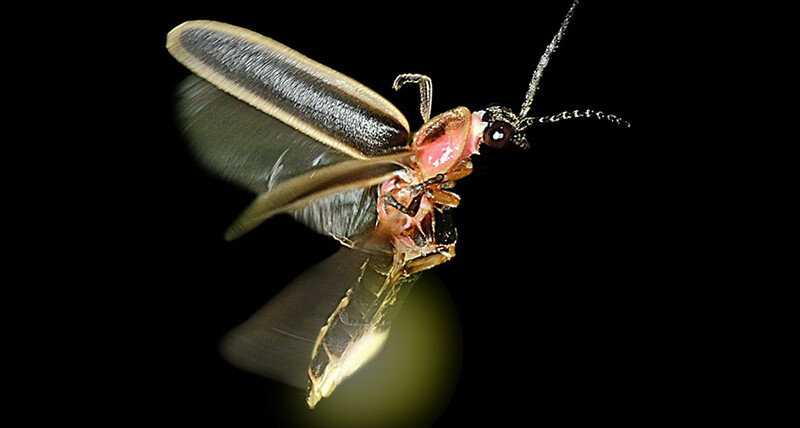 Painstakingly, the researchers secured each firefly with a minuscule paper belt under a microscope, and, with a tiny brush, applied two coats of black paint to the flashing back end. Each bug rump - they painted dozens - took about 45 minutes to cover. That's one of the reasons the experiment took three years, Barber jokes. But the work paid off: When the researchers exposed a new set of bats to the darkened fireflies, the bats took about twice as long to learn that the bugs had an awful taste. Those bats that eventually learned to avoid the dark fireflies may have sensed the insects' distinctive straight-line flight pattern via echolocation, the researchers hypothesize. Bats may avoid fireflies through a combination of senses, echolocation to sense the insects' flight patterns and vision to glimpse those double-duty flashers.